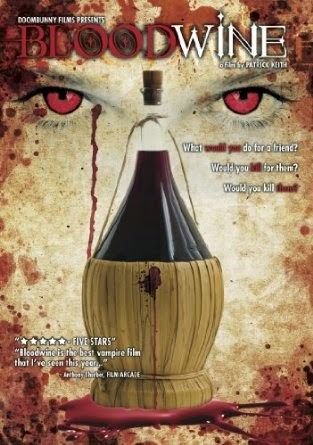 Vampire Beauties: Vampiress Review: "Bloodwine"
The Gist: Things get out of control when a a strange wine shop owner convinces a college student to buy a specialty wine which turns whomever drinks it into a vampire. Clarification: This film was a pleasant surprise as I didn't have high hopes for it (especially with the 1 hour 42 minute run time and the first 50 being drawn out scenes establishing the two roommates past together.) but once it gets past that it's a damn good vampire flick. Andrea is a girl who became goth after loosing her boyfriend and is about to get another new roommate at her college dorm as her last few end up dropping out of school. She's happy to find out that the new roommate is her childhood best friend Brandy and for the next 45 or so minutes of the film you find out that Andrea was picked on a lot when they were young and Brandy always had her back. This fact is kind of important to the film but as I said establishing this point goes on to the level that you're thinking "OK we get it already, they're friends". Anyway Brandy's birthday is coming up so Andrea goes to a wine shop and after a longer than needed conversation about her not liking the last one, a lady (who we actually see at the beginning of the movie is a vampire that Andrea eventually kills since the movie starts with it's ending) hands him a bottle and pretty much tells him to sell it to her for whatever she can afford which he does. Later on Brandy finds the bottle in the dorm room and without knowing what it was drinks it, gets really sick goes to the nurse and bites her (YES!) then proceeds to spend the rest of the movie biting every other character in it that was not Andrea. Selling Point: She likes it...she really likes it. This is definitely not one of those self hating vampire films. Once Brandy turns she's a seductress and in the end just wants poor "door mat" Andrea to feel as good as she does. Vampire Brandy is evil but in a very noble sort of way. The one thing all of her victims have in common is that at some point in the movie they were mean in some way shape or form to Andrea (which goes back to the conversations at the movies beginning that established that Brandy was always the person protecting Andrea from bullies). As a matter of fact at the movies end when Brandy is explaining her motives it's really hard to see her negatively. Who wouldn't want a woman in lingerie who is so loyal that she'll take out anyone who'll even look at you wrong. She's honestly a less pushy version of Violet from True Blood. She's only actually seen in 4 scenes in the film. The first is the very beginning of the film where they show her eventual demise. The second being when she sells Andrea the wine. The third when she appears in Brandy's dream after Brandy drinks the tainted wine and the last being the above clip when she tries to drink from Andrea. The last two scenes are pretty hot actually with her seducing the two girls. The main thing you get about Carmilla (an obvious tribute to legendary vampire seductress "Carmilla Karnstein") is that she was targeting Andrea to be the one to turn the whole time. Otherwise her role is pretty much forgotten and you never actually see anything that leads up to the battle between the two that starts the movie. This movie has pretty high rewatchability (especially if you just start at the 45 minute mark) and two hot seductive vampires. Vampire Beauty rating of 5 out of 5. Could the overall movie have been better?...sure but as far as these low budget films go this is definitely well above average storytelling for a vampire film.